Politics | Kevin K. Boeh, Ph.D. The Tippie School at U. of Iowa run electronic markets to trade futures contracts that represent expected outcomes of real events. 2012 presidential race contracts were used to track the expected election winner. A student pointed out that the Republican victory contract was negatively correlated (=-.83) with the S&P close, and incorrectly concluded that the markets rose in anticipation of the Democrat winner. Correlation is not causation. 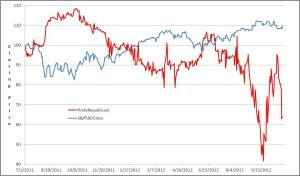 Both data series have secular trends; it is incorrect to analyze time series data like this. Without going too far into technical details, you must instead analyze first differences (changes in prices) or returns. As it turns out, even with a large sample (18 month of daily trading), there is no significant correlation between the likelihood of either party winning and the S&P500 close using proper methods. 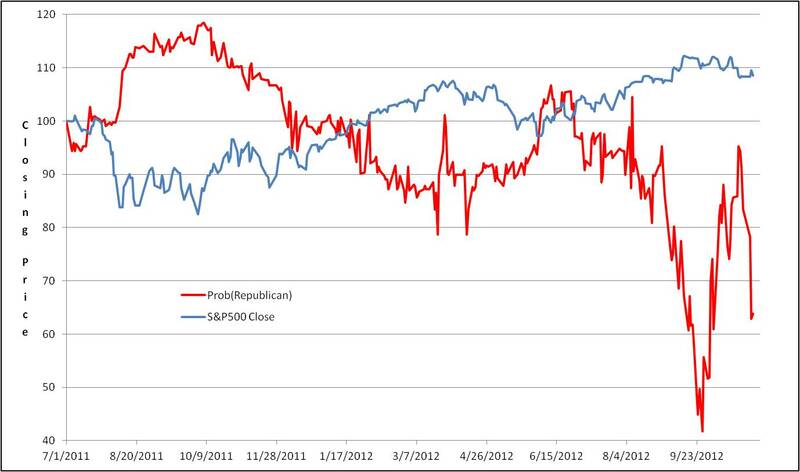 Furthermore, lags (e.g., the change in Republican likelihood today affects the S&P tomorrow) are insignificant. That is not to say there is no correlation, but rather one cannot conclude that the correlation is different from zero. While it is likely the stock markets have a party preference, we cannot find it in these data. This entry was posted in Politics, Statistics on January 11, 2014 by Kevin.